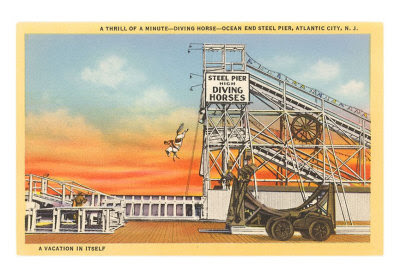 This story in the weird news brought to mind the diving horses of Atlantic City, New Jersey. I was surprised to find that the attraction did not end until 1978 (watch this video between the 2- and 3-minute mark) and that PETA was not more outspoken about the animal abuse, until learning that the organization was not founded until 1980. 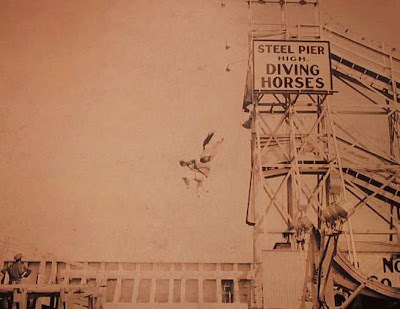 The diving horse attraction was begun in the 1920s by American showman William "Doc" Carver (1840-1947), inspired by his horse's jump from a collapsing bridge. Carver employed his daughter-in-law Sonora Webster Carver (1904-2003) to mount the galloping horses just before they reached the end of the 40- or 60-foot pier and plunge into the water with them. On one such dive in 1931, Sonora's retinas became detached when she hit the water with her eyes open. Despite the resulting blindness, she continued to dive the horses until 1942. Her story is told in the 1991 film "Wild Hearts Can't Be Broken," but after seeing it, she told her sister, "The only thing true in it was that I rode diving horses, I went blind and I continued to ride for another 11 years." Nevertheless, it has inspired 2 impassioned YouTube videos, one with clips from the film and the other in documentary style. My Mom remembers seeing the riderless diving horses at a similar act at Lake Compounce in her hometown of Bristol, Connecticut.